Is the Lenovo Yoga 2 11 the best affordable convertible around? This is Lenovo's cheapest ever convertible. Let's find out how much bang for your buck you get in our Lenovo Yoga 2 11 review. 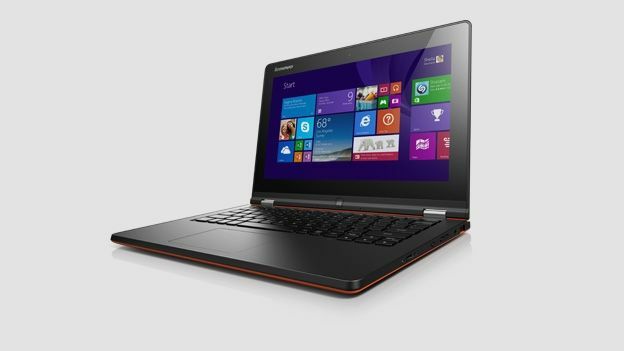 Lenovo has been one of the leading lights in the convertibles product category. It now has a whole range of models, including the Lenovo Yoga 2 Pro, and Yoga 11S, but the Lenovo Yoga 2 11 is its most affordable yet. In fact, it's almost half the price of the Asus Transformer Book Trio, though that device does have a second operating system to offer. The Lenovo Yoga 2 11 is an 11.6-inch model, so it's very portable. It's not the lightest around - 1.4kg is noticeably heavier than the same size MacBook Air, but then you can't twist the Air's screen around the back and use it in different modes. It's pretty slim though, with dimensions of 207x298x18mm - that's thinner than the 13.3-inch Toshiba Kirabook, which is a very nice piece of kit indeed. The keyboard is very good too, roomy enough so you're not constantly making typos. The main selling point of the Lenovo Yoga 2 11 is that it transforms from a laptop into a tablet. The screen doesn't detach like on the Asus Transformer Book Trio, but instead folds back on itself, like a particularly supple gymnast. This means you can use it in a number of different ways. You can use it as a laptop, or fold the screen all the way back and use it as a (slightly portly) tablet. Fold it into an upside down V shape - tent mode, as Lenovo calls it - and it's nice and stable for watching a film or showing off your photos. The last mode is stand mode, in which the keyboard is face down on the desk with the screen facing you. To the user, the result looks a bit like a laptop that's had the keyboard lopped off. We can't imagine using all of these modes that often. In our time with the Lenovo Yoga 2 11, we stuck mostly to laptop and tablet modes, with the occasional session in tent mode thrown in. But you can never have too much choice. The Lenovo Yoga 2 11 realises you're shifting modes, and orients the screen accordingly. This is very nippy - by the time you've folded it, the screen has adjusted, so full marks for that. The hinge feels very strong too, like you could twist it for years and not have to worry about it loosening. The on-screen keyboard also pops up when the physical one is folded away, meaning you don't need to tell it when you need it. The 11.6-inch screen has a resolution of 1,366x768 pixels, giving it a pixel-per-inch count of 135. That's on a par with the same size MacBook Air, but much lower than the MacBook Pro or iPad, both of which have the Retina display. As such, the colours don't jump out at you as much, and it's not quite as retina-searingly bright. But it's responsive, and has a decent contrast ratio. And it's one of the better screens we've seen on a device costing this much. Now, this is where things start to come unstuck. The Lenovo Yoga 2 11 has an Intel Pentium processor, instead of the Core i7 found in its stablemates. It's fine for everyday tasks like web surfing and word processing, but you're out of luck when it comes to games. We couldn't even install some, because the Lenovo Yoga 2 11 didn't meet the minimum system requirements. Fail. Other processor-heavy tasks like video editing are also a no-no. Lenovo says the Lenovo Yoga 2 11 will last six hours, and that was almost exactly what we got from it. If you're not using Wi-Fi, and not video streaming (like we were), you'll get a bit more. It's respectable for this price, but it's not an all-day laptop by any means. If it's a gaming powerhouse you're after, this convertible isn't for you. But as a low-cost laptop-tablet hybrid that's fine for everyday use, it's definitely worth a look.